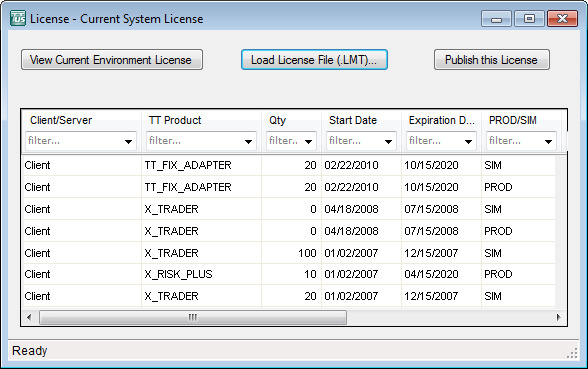 TTLICENSE.LMT (referred to as the .LMT file): This file is the actual license file that must be loaded into the TT trading environment in order to run TT software. Only one .LMT file controls the entire TT system. However, this file must be updated whenever the customer installs new products or renews his license with TT. TT encrypts this license file. All licenses in the .LMT file include an expiration date after which you can no longer use the software. TT1300SW.dll. The .dll file contains the keys used to decrypt the TTLICENSE.LMT file. Customers must review and renew their licenses on a quarterly basis. You can use TT User Setup to monitor the number of licensed applications (and their associated IP addresses) that are logged into the system, and to load license files. This functionality was previously provided only by Guardian. In a X_TRADER ASP environment, only TT Administrators are allowed to view and publish license files. Log onto TT User Setup as a Super Administrator. From the Server Admin menu select License Setup. Client/Server Lists whether this license is a Client license or a Server license. TT Product Lists the TT Product to which the license applies. Qty Lists the number of licenses assigned. Start Date The date the license becomes valid. Expiration Date The date the license expires. Prod/SIM Lists whether the license applies to environments running in Prod mode or SIM mode. Min Version Internal use only. In Effect If the current date is between the license Start Date and Expiration Date, and if the Prod/SIM setting for the license matches the Prod/SIM setting in guardian, the license is considered in effect (In Effect is set to yes). If the license is expired or set to a different Prod/SIM setting than guardian, the license is not in effect. The number of markets to which the license applies. If the license applies to all market the value is "All". Exchange The exchange to which this license applies. If this field is blank, the license applies to all exchanges for the product. IP Address Used by server products to specify the IP address that the server product is allowed to run on. When you are finished viewing the licenses, close this window. Or, to load and publish licenses, continue to the next topic. Before traders can use the TT Trading System, you must install the appropriate license file. Note: A TT Gateway does not appear in Guardian until its license has been loaded. Note: If you replace a pre-existing license file with a newer one (i.e., you’ve added new components to your network such as X_TRADER® workstations), TT recommends that you verify that the filename of the new license matches the filename of the old license file, and the date of the license file is more recent than the old license file. Copy the .LMT, .dll, and license text files to a folder that is accessible to this TT User Setup client. The License Setup window appears. Click Load License File, navigate to the folder that contains the license files, and then click Open. TT User Setup returns to the License Setup window. When TT User Setup alerts you that the license file was published, click OK.